Poorly designed SharePoint and Office 365 applications can introduce risks if they are not assessed before deployment. Rencore helps you and your team to understand how your SharePoint applications are built and whether they contain any harmful code. Don't deploy harmful and potentially insecure applications to production ever again! Are you ready to take the first step towards establishing a quality gate in your deployment process? 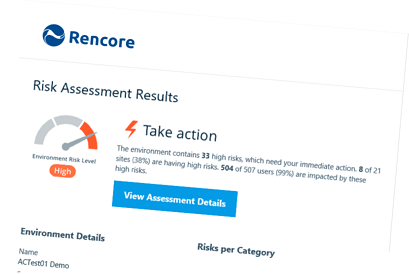 Schedule a Rencore Risk Assessment to learn more about the current state of your SharePoint environment and how to optimize it. Deploying poorly built applications leads to a range of detrimental effects for your business such as loss of intellectual property, legal fines, noncompliance to standards, image loss, and competitive disadvantage. Take our Risk Assessment to find what SharePoint applications are used in your organization, what risks they pose and how you can mitigate them. Our powerful analysis engine assesses your SharePoint application risks, our experts will show you the threats they pose to your organization and ways how to mitigate them. Using this detailed information, we help you to make an action plan for your organization to prevent these risks from becoming a problem.